So you would like to know about us?! Rock’N Mick’s is a Hair Salon that started in 1999. Sisters Michelle Claxton and Rochelle Clark decided to combine their passion for hair and start their own Business. 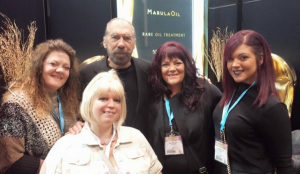 Both sisters along with their experienced staff are continuously expanding their skills and knowledge on the industry attending many trade shows around the world. Rock’N Mick’s Hair Hut realizes and understands the value of fashion and the latest trends to customers and offers professional, quality service without the high price tag that you would find in other Salons. Rock’N Mick’s Hair Hut is a family friendly hair salon that welcomes everyone to come in and enjoy the wonderful atmosphere created by the appeal of the salon and the positive attitude that Michelle, Rochelle, Marielle, Kelly, and Jocelyn shine on everyone around them. Rock’N Mick’s Hair Hut cares about their customers and believes that your Hair needs are their number one priority. If you are looking for the latest in Hair styles, products and more, they have it! If you are having hair troubles, they can fix it! Rock’N Mick’s Hair Hut is located at the corner of Finch and Wellington, at 49 Finch Drive Sarnia Ontario. Rock’N Mick’s Hair Hut looks forward to meeting you!